Published on September 9, 2012. Takes about 1 minute to read. Doctor Who is a long-running (from ‘63!) British sci-fi / adventure show with an unique approach to storytelling. I discovered the show somewhere in the middle of the 3rd series (of the 2005 reboot) and was instantly enthralled: it was something new yet immeasurably old, something that could always surprise and draw you in. To my great disappointment, this has changed. The time of the Tenth Doctor (played by David Tennant) was by far my favorite. The episodes had it all: comedy, drama, mystery, adventure and yes, emotional depth. The show wasn’t afraid of the hard topics and indeed, good characters died, there wasn’t always an happy ending and the tragic story of the doctor drew the viewer in. The “death” of the Tenth Doctor was truly moving, but it also marked the start of another approach to the atmosphere of the show. The Eleventh Doctor, Matt Smith, is joyful, worry-free and energetic. Gone is the lonely and tragic figure in a brown duster. The show has changed and I’m unable to get emotional satisfaction from the episodes. The target audience seems to gravitate more towards children, with stories that end well, troubles that are easily solved and difficulties of life that are conveniently skipped. Today’s episode of “Dinosaurs on a Spaceship” illustrated this especially well: spaceships, dinosaurs, missiles, robots from Transformers and big frackin’ space guns that are actually stunners so it’s okay to shoot stuff with them. 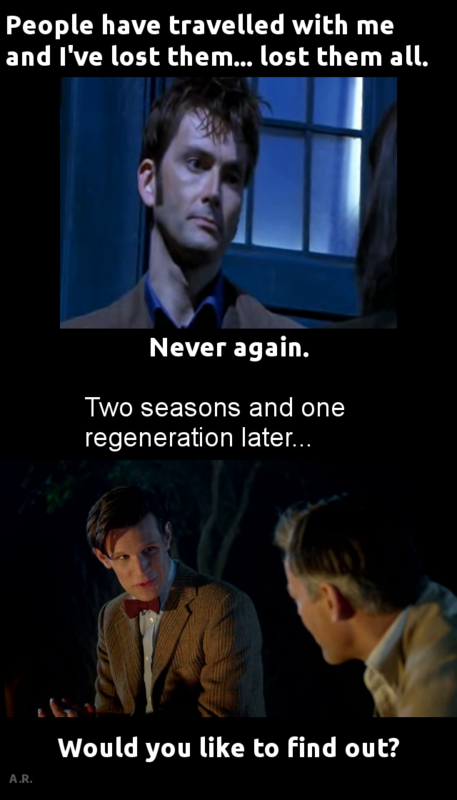 There’s of course a merit to both approaches, but in my opinion, there are enough shows to entertain children yet too few of the likes the beginning of the Doctor Who reboot: shows that tell amazing stories while also staying true to humanity, realism (okay, it’s a sci-fi show, but still…) and appealing to both audiences - adult and children.